Deluxe 10mm Thick F23 Ford F-Series Front Bench Charcoal Exact Fit Seat Cover. 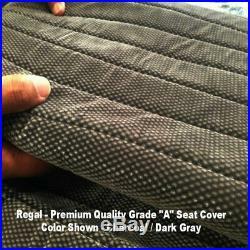 RealSeatCovers are guarantees the fit, quality, and workmanship of custom made to exact fit seat covers. RealSeatCovers are an exact fit seat covers crafted to fit your make, model and year of vehicle to exact specifications including seat belt cutouts, gear shifts, armrest opening and head rests. Our years' experience in crafting exact fit seat covers has enabled us to stock an inventory of quality patterns and automotive grade fabrics second to none. We carry most seat styles, designs in stock and time to time bring new products. To be eligible for a return, your item must be unused and in the same condition that you received it. It must also be in the original packaging. Our store is more than just another average online retailer. We sell not only top quality products, but give our customers a positive online shopping experience. Forget about struggling to do everything at once: taking care of the family, running your business, walking your dog, cleaning the house, doing the shopping, etc. We work to make your life more enjoyable. We do not guarantee, represent or warrant that your use of our products will be uninterrupted, timely, secure or error-free. We do not warrant that the results that may be obtained from the use of the products will be accurate or reliable. The service and all products and services delivered to you through the service are (except as expressly stated by us) provided as is and as available for your use, without any representation, warranties. In no case shall RealSeatCovers, employees, affiliates, agents, contractors, interns, suppliers, service providers or licensors be liable for any injury, loss, claim, or any direct, indirect, incidental, punitive, special, or consequential damages of any kind. Better yet, We will reply messages with in few hours! Seat Style / Seat Configuration. Seat Type - Front Solid Bench Charcoal Seat. Seat Style - Full Size Solid Bottom Bench. It is made specially to protect your original factory seats from excessive wear caused by children, dogs (pets), and from other heavy duty uses. We think about the convenience of your choice. Whats more, you can search our site if you know exactly what you are looking for or use a bunch of different filters that will considerably save your time and efforts. Our seat covers are premium grade as we only use up to 12mm extra thick padding and all seat covers are double to triple stitched for long lasting quality. Our seat covers are low price and give same high end quality compare to our competition. Note :- Please note the main listing photo or other photos used may be is the interior of the actual vehicle. 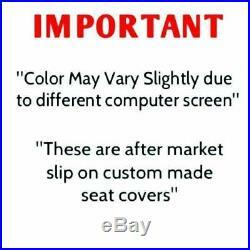 Used for reference only to show that our custom made, semi custom made and universal seat covers may fit similar seat styles shown in the listing pictures, If you vehicle seat style matches with the pictures and listing description then proceed with the order. WARNING: This product can expose you to chemicals including toluene, which is known to the State of California to cause cancer and birth defects or other reproductive harm. 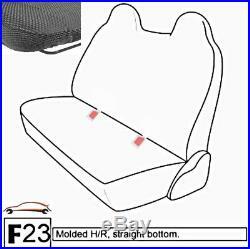 The item "F23 DG Ford F-Series Regular or Super Cab Front or Rear Solid Bench Seat Cover" is in sale since Saturday, June 11, 2016.